"Without question it was the reason why I played one more year, to be a part of that series. I played beyond that in the Tri-Nations but the main focus for me was about being a part of that British & Irish Lions series." 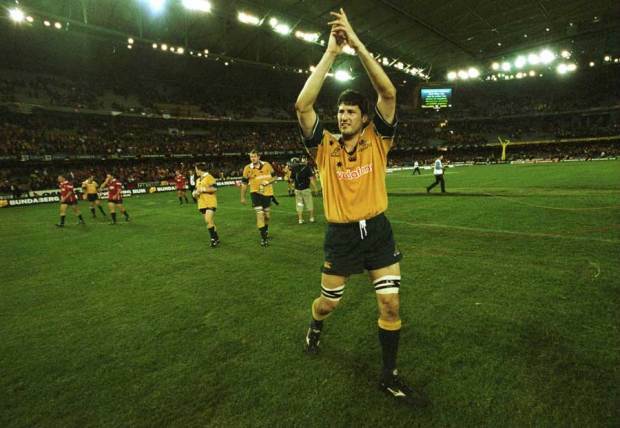 When John Eales took to the field for the third and final Test in the 2001 series between Australia and the British & Irish Lions, he was only going to play four more times for the men in green and gold. It was a series which came at the end of an illustrious international career which saw him win the World Cup twice and play in 86 Tests for his country. His place in the pantheon of rugby's greats was already secure by the time Graham Henry's Lions arrived on Australian soil but the magical nature to the tourists was enough for Eales to postpone his international retirement for another season. By the time the first Test came around, the Lions had already played six matches and were unbeaten. The Wallabies, unlike this year's vintage, played a warm-up game against the NZ Maoris but the players returned to their provinces after the match. It was an intermittent build-up to the series for the Wallabies. But while Rod Macqueen's side went into the first Test in Brisbane fully prepared, what they did not count for was the strength of the Lions' support - the famous sea of red. Eales concedes it did have an effect on his side with the Wallabies crashing to a 29-13 defeat. "You know there will always be a lot of New Zealanders in the crowd when you are playing against the All Blacks in Australia. But the black shirts don't stand out as much as red shirts," Eales told ESPN. "There were just these blocks of the ground that were just all red. And the cheering that night from the supporters was something special. And it did knock us around a little bit and dazed us. It knocked us off our game slightly which was unusual for that team. "We knew the Lions would be better prepared match wise, but we thought we would be able to overcome that. But in the first Test we were so rusty and while calculated our own tactics well, we didn't calculate theirs. From an attacking perspective we understood what we wanted to do but we weren't good at executing it. From a defensive perspective, we anticipated they would be a bit more conservative and that knocked us around a bit." But the Wallabies and the Australian Rugby Union got their respective houses in order for the second Test. Although the game was nicely poised at 11-6 at the break in favour of the Lions, it was the Australians who stormed through. "It wasn't the colour in the crowd that did it," Eales said. "But as much as that 'sea of red' struck us on the field, it also struck the Australian supporters. I think they felt that they had to get behind the team more. There was a sense of galvanising between the team and the fans and a sense that we had to stand up and do something. And it happened on that night in Melbourne, the Australian supporters were amazing. The atmosphere in the place was incredible and that was soaking down into the changing rooms. "We went into that game confident because we knew we had performed so poorly in Brisbane that we were never going to be that poor again. The score was similar at half-time but the feeling in the changing room was different. In Brisbane it was very distracted and in Melbourne it was very focused. We knew we were doing things well and if we kept doing that, it would represent itself on the scoreboard. The intercept try was lucky, but that was the only luck we had." Much of the press coverage from that game in Melbourne focused around Nathan Grey's elbow on Richard Hill which ruled the flanker out of the match and the key third Test. But for Eales, the Lions' treatment of Stephen Larkham warranted just as many column inches. "One player did not make that Lions team. That side was strong from the front to the back. If you look at the video of the game, and I did the other day for the first time in 12 years, the treatment of Stephen Larkham was as blatant as that moment on Hill. There was no way that Richard was targeted by our team specifically but if you look at the video, you could argue Larkham was targeted. "I don't think anyone would have seen or noticed the Hill incident on the field as it looked innocuous at the time. But the Larkham thing was happening right out there in the open. I can't even remember when it was, but there were two incidents which were blatant targeting on Larkham. And in the end it was a leg injury that ruled him out of the third Test." But even though they were without star pivot Larkham, the Wallabies came through the third Test with a 29-23 victory. Eales never believed the game was secure during the match and it was only at the full-time whistle that he allowed himself to relax. "After we won, we were joyful but the thing with sport, the feeling is more relief than anything else. The Lions series has that great uniqueness about it and it's exceptionally rare to be involved in something that comes around every 12 years. You can miss that in your career. 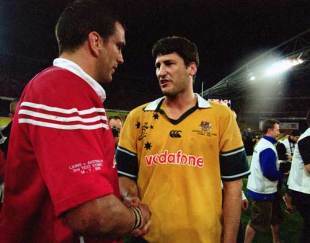 On top of that, there was the fact Australia had never beaten the Lions and to be a part of that side was very special." Fast-forward 12 years and current Wallabies skipper James Horwill is facing the challenge of getting his team mentally and physically prepared for the all-important second Test in Melbourne on Saturday. 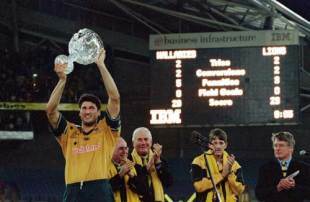 Like 2013, the Wallabies were a Test down but it remains to be seen whether they will be able to replicate the 2001 crop in the same stadium where Eales' team levelled the series. It may come down to that little drop of luck.